Vignesh Gopal is a senior at West Windsor-Plainsboro High School South. He has been under the tutelage of the renowned Vidwan Sri. Vittal Ramamurthy for the past 6 years learning the many nuances of carnatic violin in the Lalgudi Bani. He has accompanied several artists across the tri-state area. This past summer he had the honor of playing alongside his Guru in Sringeri. 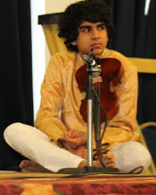 Vignesh has competed in several competitions such as the Cleveland Thyagaraja Aradhana and CMANA and won several prizes in various categories. For the past 2 years, Vignesh has been learning advanced manodharma concepts from the esteemed Sri. Ashvin Bhogendra. Outside of Violin, Vignesh participates in several activities such as Volleyball, Toastmasters, and serves as the Under-Secretary General of his school’s Model United Nations team.